No, not the NY Press, which as reported below, broke the story of the Virginia Fields' campaign use of doctored photos back on June 29th. The corporate press failed to discover (or touch) the story until July 6th. Even the Observer's Ben Smith (who seems to falsely suggests others of fabricating stories) didn't post it on his Politicker blog until yesterday, prompted by Chris Brodeur. For the pundits' comments to Virtual Virginia, go here. The dam seemed to break today with stories from the Daily News (front page no less), the New York Post and NY1. With the latter, maybe that will give Dominic Carter and Davidson Goldin something to talk about for a few months. For those stories, click below. And for a readable version of the doctored flyer, click here. This campaign flyer for Democratic mayoral hopeful Virginia Fields is intended to show that the Manhattan borough president has diverse ethnic support. A picture isn't always what it seems - especially in politics. Democratic mayoral wanna-be Virginia Fields - whose campaign slogan is "A Mayor for All New Yorkers" - cut-and-pasted a diverse group of citizens into a campaign flyer in a bid to make it look like she has broad support. The photo shows the Manhattan borough president standing in front of a TV microphone surrounded by a multiethnic group - black, Asian, Latino and white. Anyone looking at the picture might be forgiven for thinking it was a real scene from the campaign trail. But Fields' campaign guru Joe Mercurio acknowledged yesterday that the picture was actually a "collage" created from at least four different photos - and that an Asian couple, a woman who appears to be white or Hispanic and men of different races were all pasted into the image. "It's actually four photographs," Mercurio told the Daily News. "We were putting together a representation of the kind of support she has and the kinds of people she is reaching out to." Mercurio insisted that such "composite" pictures are not unusual in campaigns and that there was no attempt to mislead anyone with the flyer, which includes the "A Mayor for All New Yorkers" slogan. "It is not supposed to imply a specific event," added Mercurio of the picture, which was first reported by the New York Press. "I think it does imply the kind of support she has." Her mayoral rivals declined to comment. But the cut-and-paste job came as a surprise to several political operatives. "It's something that is embarrassing, and you shouldn't do it," said one campaign veteran. Others were astounded that Fields' campaign aides didn't simply assemble a real group of diverse New Yorkers. "Candidates should always strive for accuracy," said Rachel Leon, executive director of the political watchdog group Common Cause New York. "I think she should go out tomorrow and find a group of diverse supporters and take a real picture. In New York, that shouldn't be hard." "It's kind of the easy way out," said Ken Sherrill, a political science professor at Hunter College. "Does it mean they have someone in the office who is adept at Photoshop, but not the political people to round up a group like that? I don't know." The bogus picture will put Field in a corner, said GOP political consultant Roger Stone. "It's now incumbent on C. Virginia Fields to prove she does have diverse support," he said. Mercurio declined to say how many of the flyers the campaign printed or where they have been distributed. It's not the first time that campaigns have played fast and loose with photos. In the most recent presidential contest, Democratic nominee John Kerry was pasted by rivals into a shot with Jane Fonda - aka Hanoi Jane - at an anti-Vietnam War rally. 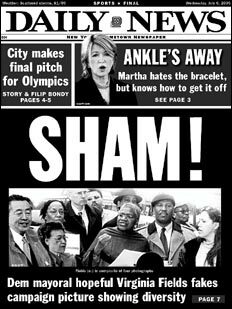 July 6, 2005 -- Virginia Fields' campaign admitted yesterday that it doctored a photograph on one of its fliers to make it appear the mayoral hopeful was accompanied by Asian and black supporters. 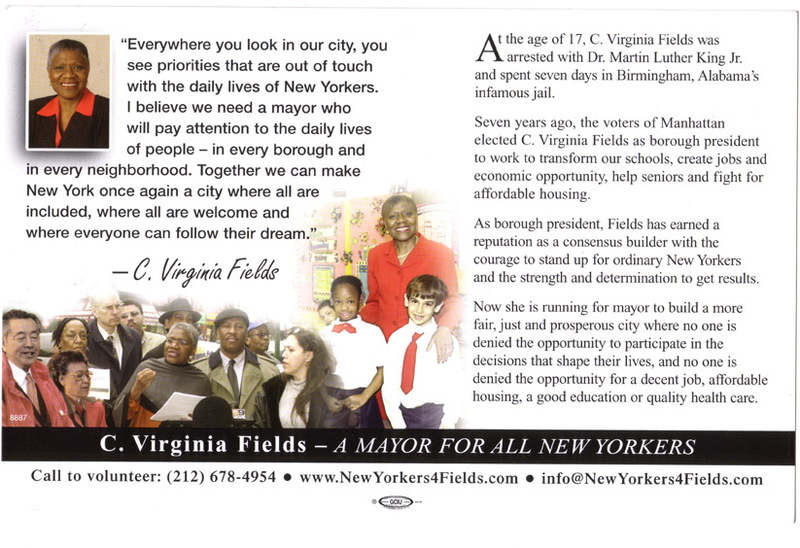 Fields' chief consultant Joseph Mercurio said that the photo in the handout - "Virginia Fields, Democrat, a Mayor for All New Yorkers" - is actually four separate pictures that were melded together into one. Mercurio said the fake photo was intended to represent Fields' "inclusiveness." The questionable picture features a rainbow coalition - two Asian-Americans, one Hispanic-looking man, one white male, three black males, one black woman and one white woman. The photo is made to look as if it were taken at a single event - a Fields press conference. The accompanying flier text says Fields would be a mayor who pays attention to New Yorkers "in every borough and every neighborhood." Fields' Democratic opponents immediately tore into the scam. "They Photoshopped this? They admit it?" asked a top aide at a rival campaign. A staffer at a second campaign questioned why the photo hadn't been vetted more thoroughly. "This is something that should have been caught, that should have been seen," said the staffer. He declined to say anything on the record, preferring to let the Manhattan borough president take the hit by herself. Jerry Skurnik, a veteran political consultant who's not involved in the mayor's race, said Fields' campaign blew it. "You shouldn't do that," declared Skurnik. Mercurio defended the flier, saying there was no intent to deceive. "This is just a representation," Mercurio said. "There was no attempt to make it look like anything other than a collage." He added, "It's not purporting to be anything in terms of a particular meeting. It's symbolic of the support she has. There was no attempt to make this look like anything other than a collage." All public polls show Fields running second to Fernando Ferrer in the four-way Democratic primary, with City Council Speaker Gifford Miller and Rep. Anthony Weiner trailing. As the only African-American woman in the race, Fields has been largely immune from attacks from foes who have to worry about upsetting black voters. Mayoral hopeful C. Virginia Fields is in some hot water after it was revealed that a photograph she used in a campaign flyer was doctored to make it look like the Manhattan borough president has broad support among new Yorkers with diverse backgrounds. The picture, on a flyer with a tag line reading "Virginia Fields, Democrat, a Mayor for All New Yorkers," shows Fields standing with a diverse group of people from different races, including two Asian-Americans, one Hispanic-looking man, a white male, three black males, a black woman and a white woman. Fields' chief campaign consultant, Joe Mercurio admitted the picture was a composite of four separate photos, but that it was meant to show that she does have broad support and was not intended to deceive anyone.